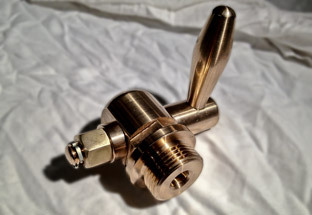 This month we've been working on some valves, copied from a broken cast part and re-manufactured exactly as the original from solid phosphor bronze. The valves are fitted to tornado, living in the bottom of the smokebox and are used to drain the build-up of water that collects in the bottom of the chamber. The seal is formed only by a machined male and female taper that fit very neatly together, allowing the valve to be operated whilst restricting any leakage. 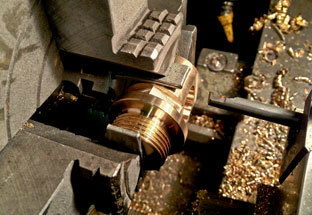 We first produce a basic production drawing of the individual components from which we can re-manufacture the parts. The valve is completely water and gas tight but relies upon only the seal of two close fitting tapers - no rubber seals here! 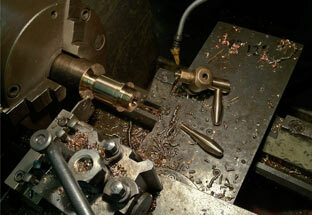 The milled part is then mounted into the four jaw for taper boring. We use aluminium packing to stop the jaw marks transferring to the soft bronze material. 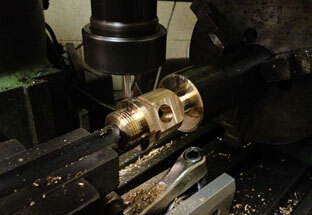 In this photo you can see that the boring bar is set upside down - this is so that we can set the compound slide to the required angle to machine the male taper - then leave it set exactly the same to machine the female taper as well. Perfect to make sure that the tapers match without too much 'blueing in'. Components were featured on the website home page (April 2012).